Toasting and grinding your seeds is so worth the effort, and doesn’t take long at all. Serve this dhal as a main dish with rice or as a side dish. It is aromatic, rich and delicious. You’ll need coffee grinder, spice mill or mortar and pestle for this recipe. In a saute pan over medium heat, toast the seeds (but not the dried red chili) for about 5 minutes, stirring frequently. Remove from pan and let cool. Transfer to coffee grinder, along with the dried red chili and cinnamon, and grind to a fine powder. Over medium-high heat oil a soup pot, add onions and saute for 5 minutes. Add garlic and ginger and saute 5 more minutes. Add spices and salt, saute 5 minutes more. Add 4 cups of water and stir to deglaze the pot. Add tomato paste and lentils. Bring to a boil then lower the heat a bit and simmer for 20 minutes. Add the tomatoes, lime juice and cilantro and more water if it looks to thick. Simmer 10 more minutes, or until lentils are completely tender. I’ve been meaning to try making dahl forma while now, I’m definitely going to be bookmarking this recipe! Trying this right now and the aroma in my house is fantastic! January vegan challenge: Opening day! « Vegan Challenge! This recipe is awesome! Simply the best soup I have ever had! I like a lot of spice so upped the spice (fenugreek, coriander, cumin and mustard (doubled)). myspicesage.com has all the spices if your grocery does not and they have good fresh spices. Didn’t care for the strong clove and lime flavors the first time I made it so lowered these. I used 2 cloves and 1/2 lime and I think it was perfect – still got the complex flavor, but didn’t over-power. I also substituted the peanut oil with olive (e.v.o.o.) and it works fine. I now double the recipe and freeze in plastic, microwaveable dishes to take for lunch – so great for cold winter days! Last few minutes…. « Vegan Challenge! This is seriously the best red lentil dahl recipe I have made. And I’ve tried a couple! Even my boyfriend, who doesn’t usually like lentil things thought that this was delicious! thank you! This is lick-the-bowl good. And my house smelled great for days from the spices. Add some cauliflower and sop it up with garlic naan…perfect!! i’ve made this dish about 8 times over the last 2 years, and every time it is amazing! i sometimes just a big can of tomatoes instead of fresh (just add them towards the end and heat through), and i alternate between veggie broth and a couple of veggie bouillon cubes, depending on what i have around. it’s always good, but definitely better with the broth. and definitely take the time to toast the seeds–totally worth it! This is by far the best Dahl I’ve ever tasted. I’ve never bothered making stock/broth, just sub water, as I’ll usually try to make something else if I have stock and this is already excellent as is. The toasting of the spices is essential. This and naan makes the perfect meal. I also use sambal oelek instead of chillis. Btw, I’m a big meat fan. This is the recipe that made me discover PPK and order vegan with a vengeance and veganomicon. 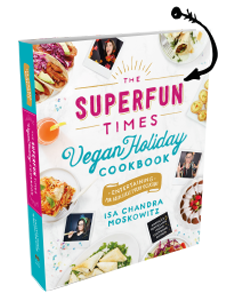 I’m far from turning into a vegan or vegetarian but these are great recipes regardless and good to have for when you do get vegan or vegetarian guests over. I have made many lentil dals, and this is by far the best! The roasted spices make it delicious and interesting. I make it in double batches, over and over again. Everyone in my family loves it! This may be a silly question, but do you remove the cardamom seeds from the pod before grinding or leave it all included? I have made this many times and while i cook alot for friends this is the one dish i get the most requests to make. I am now making it for Christmas lunch tomorrow at my sister inlaws request. She wants some for lunch and some for her present. OMG!!! The house is full of the sweet smell of spicy dahl…so tasty too! Isa YOU ROCK! Making it right now. Gorgeous! It came out great – or delicious according to my husband! Just after I cooked it it it had some “rough edges” – the taste of some spices like cardamom or cloves was too strong, but after a couple of hours it found its balance and developed a reach, deep, satisfying taste! When does the vegetable broth come in? Am I missing something? I think the broth comes in where the instructions say “add 4 cups of water”. I’m just about to try this recipe and have a question. Do you toast the cloves and cardamom as well as the seeds? This was so aromatic and all-together wonderful even with my subs (ketchup for tomato paste, a can of tomatoes for the fresh, and water instead of veg broth). And toasting the spices couldn’t be easier or more worth it. Thank you for another successful dinner cooking for the boyfriend! This is the very best dahl recipe I ever made or ate! Sent the URL for this recipe to my Omnivorous friend, He LOVED IT!! 🙂 I love it too, had a slight addiction to it for a while, had to moderate myself. My Vegan Mum loves it too!!! Made this for a vegan soup exchange today and it’s great! I used ground cumin (1 tsp), ground cloves (1/4 tsp), and only half a lime. As someone else posted, it makes your home smell amazing, and is delicious! Made this last night minus a few herbs and with a few extra veges thrown in, made it creamy by mixing in some mashed potato, and was amaze!!! OMG thank you for this recipe!!! It tastes soooo authentic!!! I added tiny chopped zucchini and fresh corn and a little chopped kale for a more veggie-full version. I’m eating it as a soup and think I’ve died and gone to Indian heaven. Thank you for making my first try at making an Indian dish so successful!!! I had to give up animal products three years ago due to health concerns, and my very supportive husband was convinced that transitioning to a vegan diet would be nothing short of torture. This is the recipe that changed his mind! I must have made this over 30 times since then, and I still come back to this post to double-check the amount of spices, and today I realized I’d never left a comment. (You’d think I’d have it memorized already, but not yet.) This recipe is so good I sought out all of your cookbooks, and they’re the ones I always find myself reaching for on a daily basis. After all this time, I figured I should at least thank you for posting it! It’s amazing! This is our go to recipe whenever we have an afternoon free to potter in the kitchen. Beautiful flavours and smells. Just love it! I was looking for a good recipe a while back to make for my vegan nieces. We ALL loved it and I make it regularly now. DELICIOUS and I love the way the spices smell after toasting and grinding. Thank you!! A great vegan lentil dahl recipe using whole spices and fresh herbs. We used olive oil instead of the peanut oil and added the tomatoes at the start to allow them to cook through the dahl thoroughly. Also added of a few curry leaves to add to the flavours. Will be adding this recipe to our favourites collection. Yummy. Oh man this was so delicious. Another solid af recipe from the PPK. I feel like i remember that you had previously named this “Simply the best Dahl”… Maybe that was in your comments. Anyhow that is the title it deserves. I have made this often and it never fails. Thank you for sharing such a great recipe. Thanks first marvelous posting! I savored reading it; you are a great publisher.I’ll be sure to bookmark your site and could keep returning someday. I would like to encourage that you maintain your great articles, have a good weekend! This is still one of my favorite recipes after all these years! Thank you!!!! Isa this is awesome love your book! The recipe says veg broth but instructions say water. I want to clarify what to use. Thanks!